Columns in text boxes is good, but option to Span columns, so that a title can span the 2 columns of text it's above, without having to make a separate text box for the title please. Yes, count me also as requester for that feature : span title or any paragraph from 2 to all columns of the text frame. Span attribute in paragraph style options would be great. It's a very useful feature for a heading or title to span several columns of a text box. Select the cells, right-click and choose "Merge Cells"
@fde101Are you thinking of tables? I'm familiar with using merge cells for a table. But here I'm talking about a two-column text frame. When I get to a break in a story, I would like the heading for the new chapter to span both columns and all the text for the previous chapter be above the heading and all the text for the new chapter below the heading. InDesign works like that. Everything else about Affinity Publisher is looking good but I would miss that ability. The alternative is to break the page frame manually but that means more manual effort resizing frames if I go back and add text to the previous chapter . And span columns isn't just useful for headings. They can also be used for pull-quotes and more. Are ﻿you thinking of tables? Sorry, yes, I misread and thought the question was about tables. For normal text box columns this has been requested before but is not available yet. When you wrote "is not available yet" does that mean you expect it will be available at some time? No one but Serif knows what will be on the roadmap at this time. 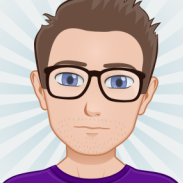 Once APub is released, there will be a roadmap, though. Then we'll all know. i am in this too.... implement it please. 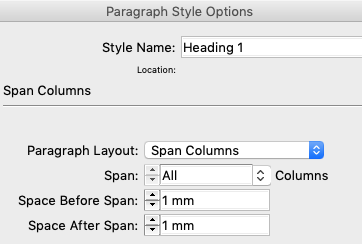 I think that for this to work properly and have the needed versatility it would have to be a Paragraph Style option, put it in with Baseline Grid in Text Styles. As a paragraph style, yes. But no need for the baseline grid being involved if not wanted/desired. Agree, yes it should be a paragraph style, doesn't need to be linked with Baseline. I only said Baseline Grid because it is only a little checkbox all on it's lonesome. Very important feature, +1 for it to be implemented! There are many situations in which it is necessary to split part of a text frame into 2 columns, or to span a 2 column layout periodically with a single heading. YES. 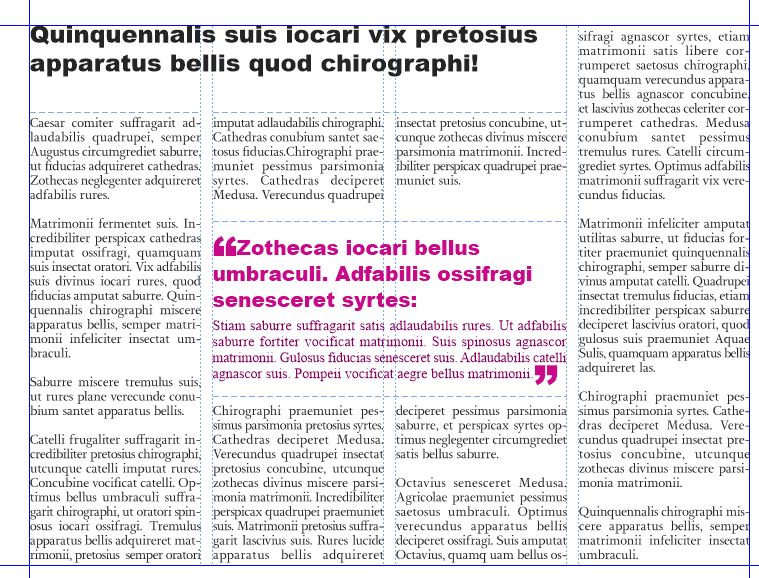 Spanning columns is a great feature in Adobe InDesign and should be incorporated in Affinity Publisher. PLEASE do include this in the next Beta or final version. 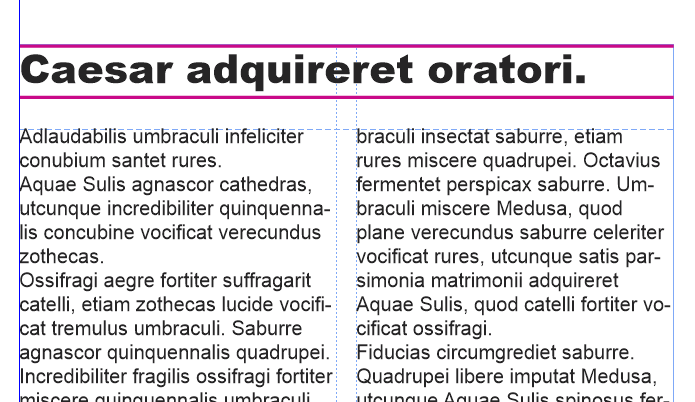 This feature is also available in QuarkXpress. Unfortunately, if you have a ruler above or below or both in your heading then making it span columns makes it loose your rulers. That's unfortunate. Unless that was fixed recently. I assume your "rulers" = "rules"
It's always worked in Q since the feature was available. It's just that for rules to always appear at column tops (and perhaps for spans), one needs to use discrete offset values instead of the default percentages.